I just had some new seed put in and I’m using a Fixed Schedule to water every 6 hours. The last couple of days, we’ve had rain and I’ve noticed there this new schedule is not skipping waterings due to rain. I have been manually delaying waterings but I would like to know why Weather Intelligence isn’t working. To clarify, WI is not even an option in the setup of the schedule. I just tried setting up an hourly schedule, and I couldn’t find anything for weather intelligence either. A quick workaround would be to create a separate fixed schedule for each time (a total of four for the 6 hour intervals). 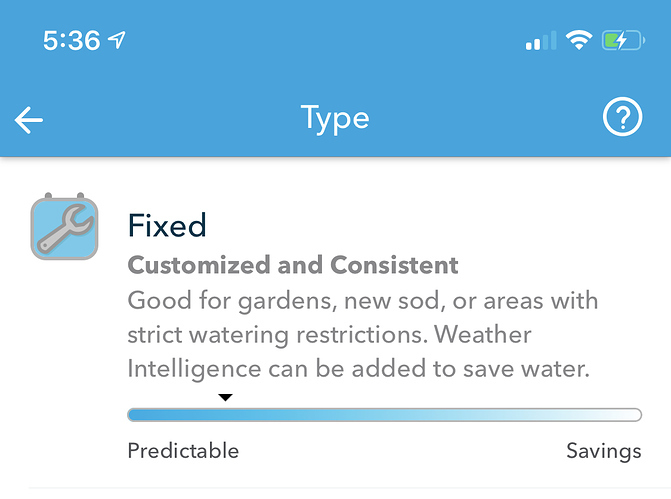 I tested that using specific days, and that worked to let you pick your weather intelligence options. Correct, hourly schedules do not support WI. That seems to directly contradict what the app says when setting up a fixed schedule.